Operation Hour: Everyday, Mall Opening Hour. Review Summary: Unique thing to try once, will need to improve for me to pay another visit. About a few days ago, I've seen this fry ice yogurt thingy video appeared on Facebook. Nevertheless, Facebook is really a good promoting channel. Well back to the topic, since I will be around the area so I decided to pay a visit to this stall. If you're in the middle ground floor of Prangin Mall, you'll see this white wall thing, which is the back side of the stall, facing the middle Ground floor. My cousin and I were approached by a friendly girl when we walk passed there. We received a brochure, and soon we noticed that they're doing their opening promotion now. Of course, the big "Buy 1 Free 1" make us happy for awhile. There were quite a lot of people queuing in front of us that time, I guess everyone is feeling excited to try out this unique dessert. First ever in Penang! 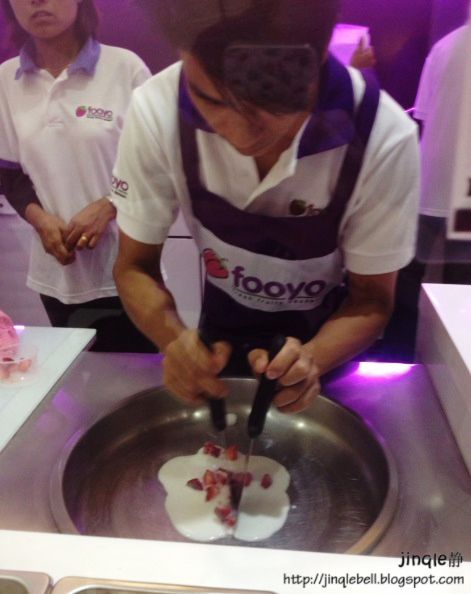 Fooyo uses fresh fruits throughout the whole making processes. From there you can see that the helper are busying cutting fruits and placed them in small small cup to make sure right amount of fruits are used. Of course, like what they claimed, yogurt are low in fat, and will make you healthy as well by helping the digestive system. Another interesting view from outside, we get to see the making procedure. So after a few moments queuing, we finally get to place our order. Few types of fruits to be choose from, which is strawberry, dragon fruits, mango, kiwi, banana and also original. I believe that they can only use soft fruits, as they'll need to somehow "mash" the fruits together with the yogurt later on. After order and payment, you'll need to wait for awhile, looking at your order being process LIVE. Cousin and I ordered mango and kiwi flavour, the buy 1 free 1 is actually buy a "main" dessert, and you get a small cup of frozen yogurt free. Since the frozen yogurt is running out of stock, we get ice blended drink as replacement. 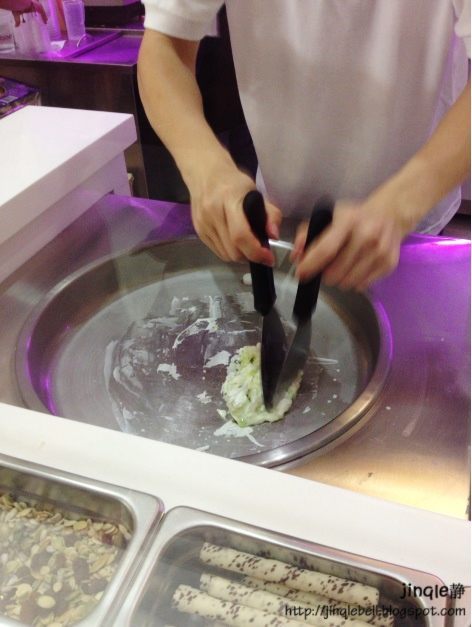 The staff will first pour in a measured cup of white liquid, which is believe is yogurt on the chilled surface. Next he'll drop in the fruits, and start chopping it. How does it looks like to you? Oh I forget to mention bout the biscuit layer at the most bottom. It gets soften and sweeten after the fry yogurt melts. In overall, it is something new for you to try if you passed by this area. Service is slow on my visit, must be caused by the crowd and insufficient staff. Waiting for this desserts took me more than half an hour. 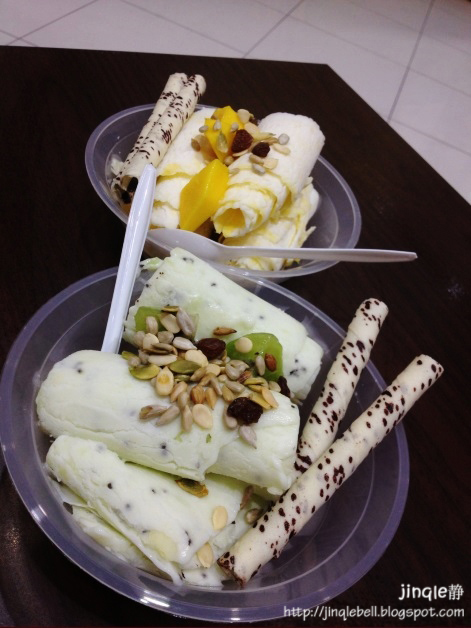 Fry yogurt has the fruity taste, but is lacking of the thickness of yogurt. More like a light yogurt to me, can barely taste the yogurt taste. Personally liked the egg roll thingy and I think it goes well with the dessert. Other than that, my cousin and I prefer the melted version more. Both of us agreed that it taste better. 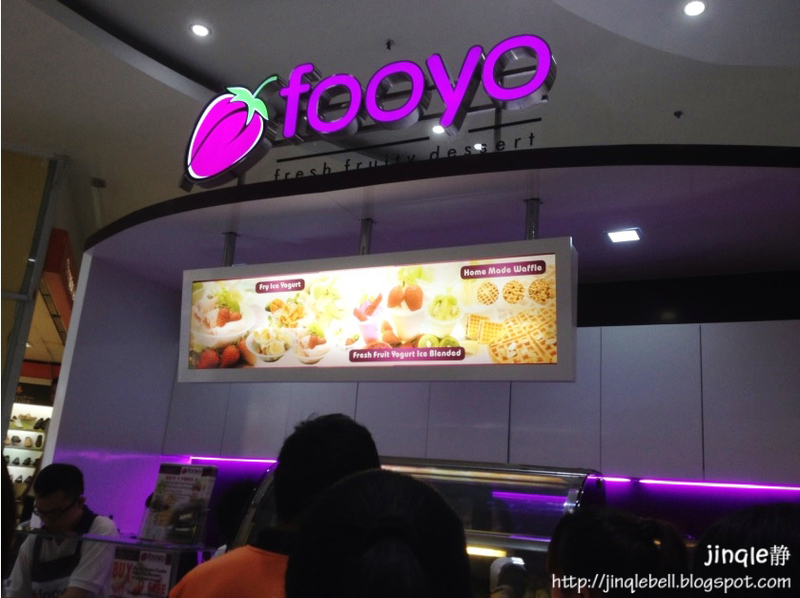 Other than fry fruity yogurt, they sell also waffles, frozen yogurt and ice blended. If I would visit again, I'll want to try their homemade waffles. 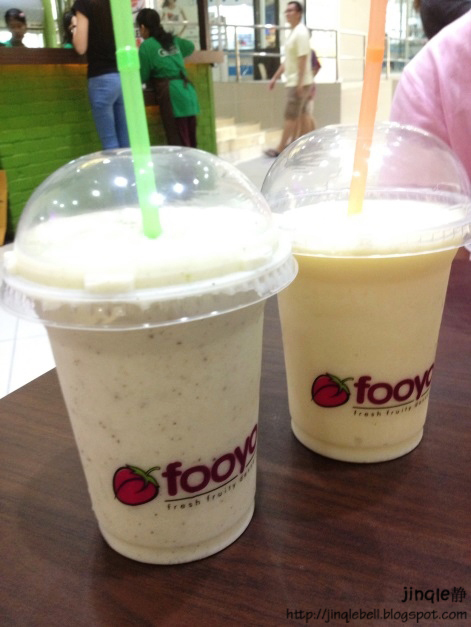 Picture above was our Free ice blended drinks, kiwi and mango as well. Drink is just normal, nothing special. Friendly reminder, don't leave the drink out for too long. Or it will become two layers, which all the fruit will go up, and the water will be on the bottom. Yep it happened on my drink. 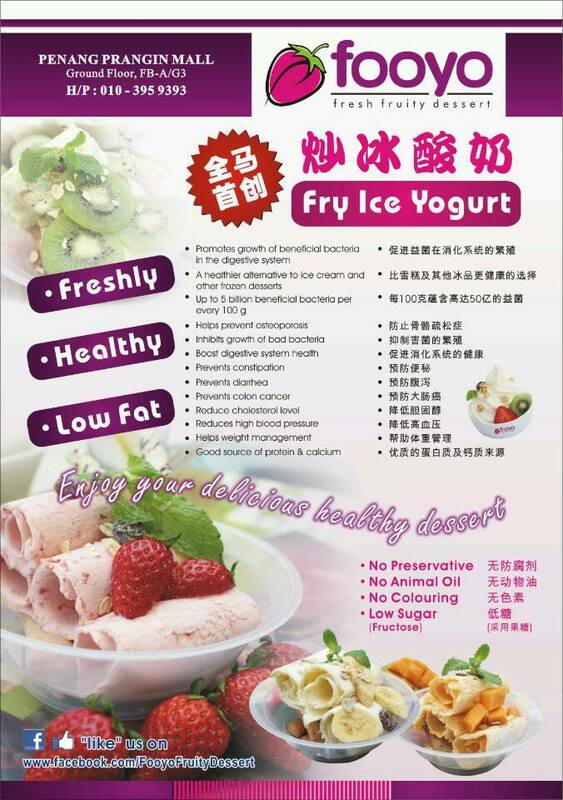 Price for the fry fruity yogurt is either RM 8.50 or RM 8.90. Same goes to the ice blended and others as they priced around this too. Personally think that they should try to offer more choices to the consumer and revise their recipe to a better one. However, the idea was great.